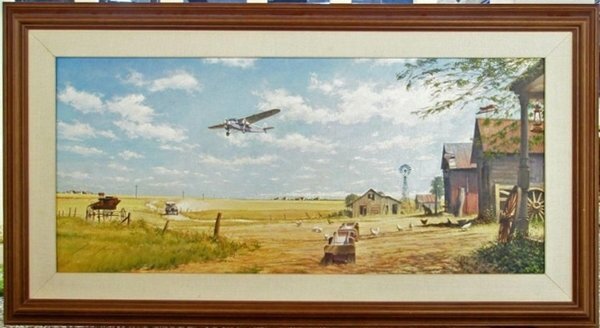 Original: Height: 14.5" Width: 33"
Framed: Height: 22" Width: 40.5"
Descending over rural farmland, a Ford Trimotor begins its approach to an airport somewhere in the country's heartland. After the railroads, few things changed America as dramatically as air travel. Although in the early days it was the exclusive domain of business travelers and the wealthy, it created air carriers and the network of airports that progressively linked community after community through air transportation. It brought the news, the mail priority cargo and important visitors. For almost a decade Ford Trimotors were flown by every major airline. In the late 1930's new aircraft designs provided speed and comfort that quickly made the trusty "Tin Goose" a relic of history.